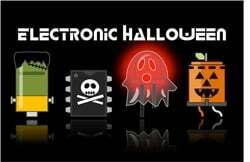 #ElectronicHalloween 2015 at Adafruit – 10/8 Update « Adafruit Industries – Makers, hackers, artists, designers and engineers! Prior installments: 9/14, 9/22, 9/25, 9/27. Becky Stern calls them “analog crafts.” Those bits of a project that don’t involve code or soldering or 3D modeling and printing. Real dirt-under-fingernails stuff. 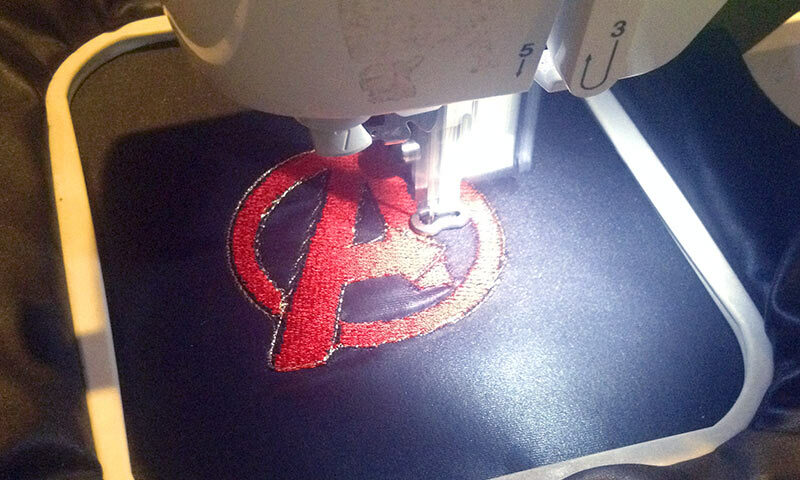 Working with stretchy fabric is hard. Working with with 3 different stretchy fabrics that have different amounts of stretch is way harder! 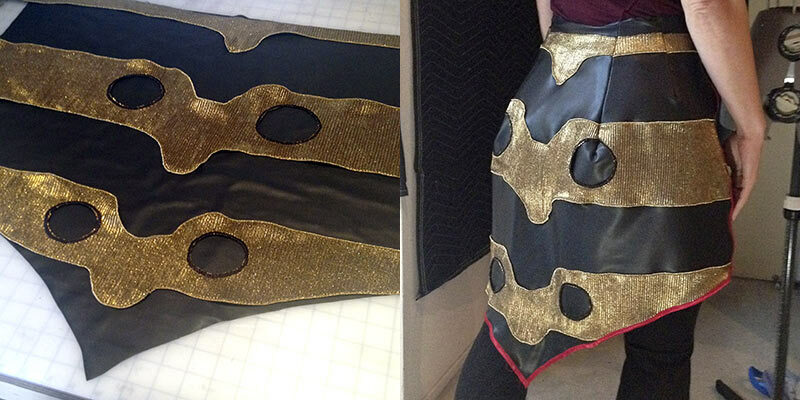 My gold fabric is thin and stretches quite differently than the black pleather fabric I’m using for most of the costume. 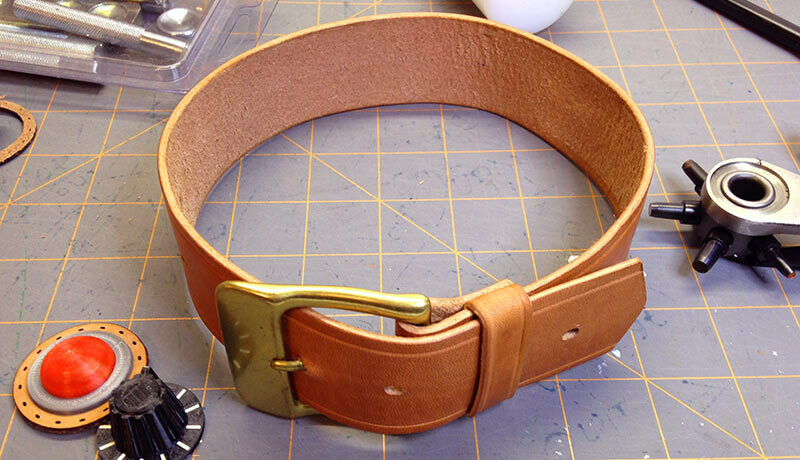 After some frustrating stitching and thread-ripping, I ended up flatlining the gold over the black, which solved most of the problems, since now all the fabric shares the stretch quality of the black pleather. Whew. I created the skirt first, then jumped right into the top. The markings on the back are inspired by the actual markings on a German wasp, and I made the sleeves reminiscent of wasp legs with pin tucks and black thread over the gold. I’m pretty happy with how they turned out. Aside from just looking really snazzy, I think this adds an important feature: as Wasp hasn’t made a formal appearance in the Avengers film series yet, and as it’s an original take on the character that even comic aficionados may not immediately recognize, the emblem adds a convenient identifying “hook” for the layperson. “I don’t know who this character is, but it’s clearly one of the Avengers.” Bam. In seemingly no time at all, Erin had whipped up this entire amazing outfit. She’s got mad skills! 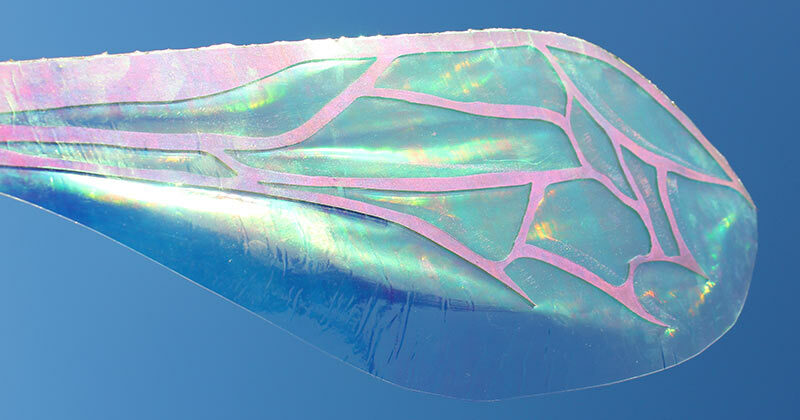 I finished cutting all the wing frames and went to apply the Fantasy Film. I’ve never used this stuff before, so there’s been a lot of experimentation going on.. it bonds to itself when you heat it up, but if you heat it too much it wrinkles and changes color, and it’s a bit of a balancing act to find just the right temperature. My first attempt, I sandwiched the wing frames between two pieces of film and bonded them together. I like the way it looks, but the awesome wing frames that I worked so hard to cut really get lost when the light is wrong. This bugs me, so I’m experimenting with using just one layer of fantasy film on the back, and sealing the front with .. something. I’ve tried Designer Dries Clear adhesive (what they recommend using on the fantasy film package) and also Mod Podge, and neither has quite given me the results I want. I’ve got a couple more ideas, so going to keep trying! Finished my parts and shipped it all off to Becky Stern to fill with electronics and shoot a video. I asked that she not show any close-ups as it’s kind of embarrassing…but in reality, probably good enough for the task. In theatre they’ll sometimes talk of the “30 foot rule” — that a lot of sets, props and costumes might actually look pretty rough up close, but from the viewer’s perspective some distance away everything on stage looks real. Fingers crossed. 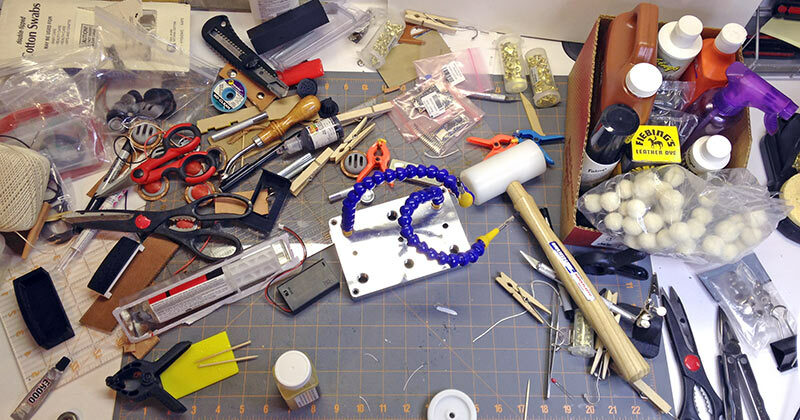 I encourage any aspiring maker to learn more “analog crafts.” This isn’t just some old fart “Dang kids and their vidya games!” rant, no…it’s something I’ve heard again and again from prolific makers, who’ll attribute their success to breadth of experience…maybe building airplane models, or sewing, or fixing motorcycles…it’s not all bits-and-bytes stuff. You know the saying about “When all you have is a hammer.” A wide range of skills, even if not expert in any of them, helps you find innovative or efficient solutions to problems (sometimes even the bits-and-bytes ones).